Our Ripple tender range of designs offer flexible options to suit size, material and weight. 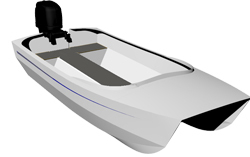 Whatever sized tender you are after you are sure to find a suitable design. From the smallest in the range, the 2m is ideal for smaller yachts up to the 4.2m which suits a larger cruising vessel. However some of these designs are also popular as day boats for exploring lakes, estuaries and other remote areas. These capable designs can carry good loads for extended trips with priority on safety with all designs fitted with 6 positive buoyancy compartments. 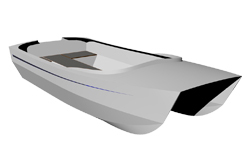 These designs are stable due to the twin hulls and have generous space internally. All are designed to plane and because of the light weight materials they are quick to jump onto the plane. The material choices include Duflex panels in foam or balsa core, plain foam or plywood. 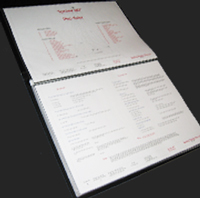 The foam core option is the lightest material and provides one of the lightest tenders available. The Duflex panels enable a very quick build time and because these panels are pressed with very low resin/fibre ratios they are extremely strong. Most cruisers prefer a hard dinghy for the usual wear and tear tenders are subjected to and they are unsurpassed when it comes to dragging over reefs, fishing out of or a surprise croc encounter. For the budget conscious the Gaboon plywood tender is still a good option and is not much heavier than Duflex balsa. Please review the designs below and feel free to contact us if you would like study plans for the design of choice. Please note that any of these designs can be purchased online in our eShop. 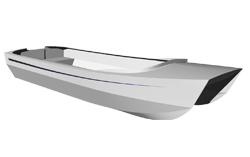 This design is suited as a tender to a large vessel. 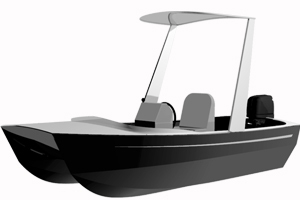 It can be set up as an open boat or as a centre console fishing configuration. 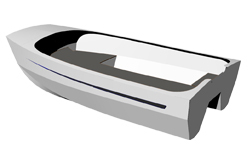 The open boat version would be more commonly chosen for use as a tender however the centre console boat would also suit. The centre console layout can also be supplied with a composite targa/hardtop assembly which covers the helm area. The fishing boat has the feature of a wrap-around fishing deck forward of the helm. 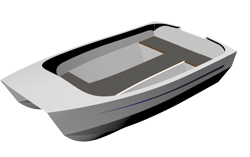 This design can carry good loads and is a capable boat which could venture offshore in appropriate conditions. This design is a little unique to the rest of the range as it was developed from the 2.8m design and lengthened according to a particular client's requests. The result was a more slender boat with slimmer hulls. It is a capable tender with good payload capacity and can easily carry 4 to 5 adults. This design proved to perform well and is used as a day tripper for extended periods. The other advantage of this model is that it will fit in a standard sized box trailer width-wise. The 2.3m Ripple design is of good internal size with a surprising amount of carrying capacity. This model is large enough to carry three adults with personal gear. This sized tender is suited to a cruising yacht 35ft to 40ft in length. This tender would be best kept on lifting davits but is compact and light enough to be man handled and stowed on deck. This design will plane easily with one or two passengers however will perform well at displacement speeds also. We had an afternoon on the Leven (next river west), an afternoon on the Rubicon (next river east) & yesterday we had a day on Lake Cethana which is the next lake up the system from Lake Barrington. I was able to get onto the dam face yesterday & got a photo looking down at Lake Barrington. Kit packages are available for this design and the options can be viewed in the Ripple Kit page. Study Plans are available for these designs, please send a request via our Contact page. Plans and kits are available for purchase through our online eshop or you can contact us.